"Gene Wilder's frank, charming memoir, KISS ME LIKE A STRANGER, is refreshingly free from the two major sins of show-biz autobiographies: self-aggrandizement and score-settling." 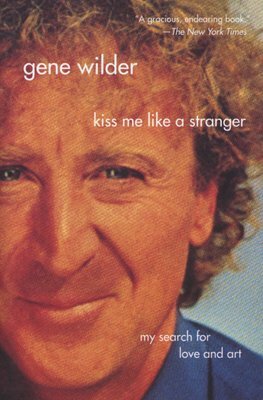 --"Los Angeles"" Times"
In this unusually personal book from the beloved star of many beloved and classic film comedies--from "The Producers" to "Young Frankenstein," "Blazing Saddles" to "Willy "Wonka "and the Chocolate Factory"--Gene Wilder writes about a side of his life the public hasn't seen on the screen. 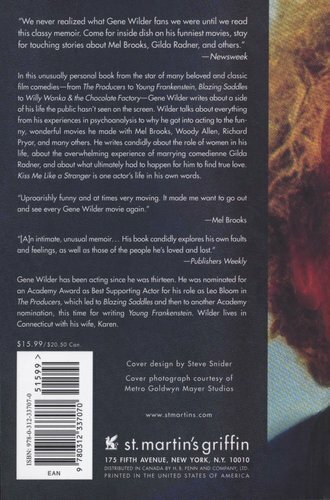 Wilder talks about everything from his experiences in psychoanalysis to why he got into acting to the funny, wonderful movies he made with Mel Brooks, Woody Allen, Richard Pryor, and many others. He writes candidly about the role of women in his life, about the overwhelming experience of marrying comedienne Gilda Radner, and about what ultimately had to happen for him to find true love. KISS ME LIKE A STRANGER is one actor's life in his own words. "an intimate, unusual memoir...His book candidly explores his own faults and feelings, as well as those of the people he's loved and lost." --"Publishers Weekly"